Show your friends and family how much you love everything Disney related by adding Disney themed décor all throughout your home. 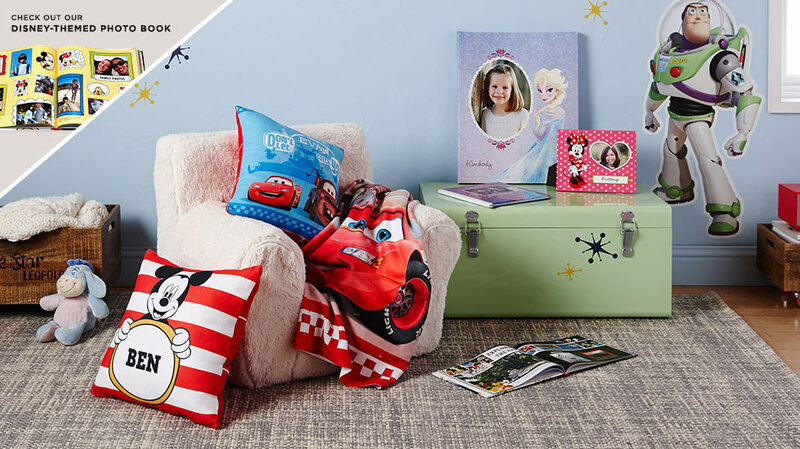 It doesn’t matter which Disney movie you like the most, Shutterfly has a wide variety of Disney characters and home accents for your enjoyment. Escape from the real world by choosing between Mickey Mouse, Frozen, Cars, Toy Story and more. No matter which character or movie you and your family like to watch, there are plenty of Disney and friends items for you use to add some fun and cartoony appeal to your favorite photos and moments in time. Customized Disney items are ideal for anyone who is in need of a great gift for people of all ages. It doesn’t matter if that special little girl or boy is only a few days old or several decades, they’ll love having a new Mickey Mouse, Frozen, Toy Story or Disney Princesses addition to welcome into their collection. If you’re planning a party or celebration, don’t forget to order your Disney invitations. Customize them with your child’s name, age, birthday and a special message or frame their face to make their invitations and cards more interesting and amusing. Or, use Shutterfly’s Disney selections as rewards, personal gifts and a fun way to keep in touch with everyone. Your little prince or princess will love the time and thoughtfulness you took to create Disney Christmas stockings, Disney pillows and bedding, Disney Valentine's Day cards, and more. No matter what the design or theme is, our photo products are made from quality materials and have a professional finish that enhances their appearance and value in a timeless and trendy manner that you’d be hard-pressed to find anywhere else. Don’t spend your time searching for something that you won’t find anywhere other than Shutterfly. Our custom gifts and invitations, along with some of the world’s most famous Disney characters, you never have a reason to be bored or disenchanted with your decor and gift giving options again.